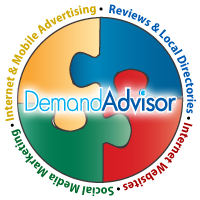 DemandAdvisor provides comprehensive services that are bundled together to provide local Internet marketing solutions, including Social Media, Local Directories, Internet Advertising, & SEO. Every service your practice needs in a fast, affordable, & effective localized Internet marketing program is included with your membership plan. A Silver Membership includes all the services necessary for the Reviews & Local Directory Listings and Social Media Marketing programs, while a Gold Membership adds all the services required for Internet & Mobile Advertising, and the Platinum program adds all the services needed for an Internet Website & Search Engine Optimization (SEO) program. Which ever plan you choose, you will get a turn-key, affordable program that will include all the services you will need in one effective, flat-rate, bundled package!